Wind is the energy source for wind turbines as well as the main disturbance to the wind turbine control system. The control system has to balance competing control objectives: increasing energy yield while reducing structural loads. However, traditional feedback controllers are only able to react to the disturbance caused by the inflowing wind field after it has already impacted the turbine. With recent lidar technology developments, information about incoming disturbances can be made available ahead of their arrival . Lidar-assisted control has become an important research topic in the wind energy and control community. The use of lidar-assisted controls is currently limited to a few research turbines, but results are promising; during initial field testing a collective pitch feedforward controller was able to reduce the rotor speed variation -. Additionally, control studies relying on simulation suggest that reductions in structural loads and blade pitch actuator effort as well as slight increases in power production can be achieved with lidar preview measurements . However, it is not always straightforward to quantify the reduction of the levelized cost of energy (LCOE) which will arise from these control improvements. One of the long-term research challenges identified by the European Academy of Wind Energy is the transformation into measurable benefit of lidar-assisted control . Therefore, the economic uncertainty of lidar-assisted control is the major perceived barrier, because it is not clear if the benefits are great enough to offset the cost of a lidar system. Another obstacle to the adoption of lidar-assisted controls is its multi- and interdisciplinary character. A thorough understanding of lidar measurement principles and limitations (e.g., availability, accuracy, signal quality, etc.) is mandatory for providing usable signals to the control system. Also, detailed knowledge about wind turbine dynamics and controls is necessary to determine which signals can be used for preview control. 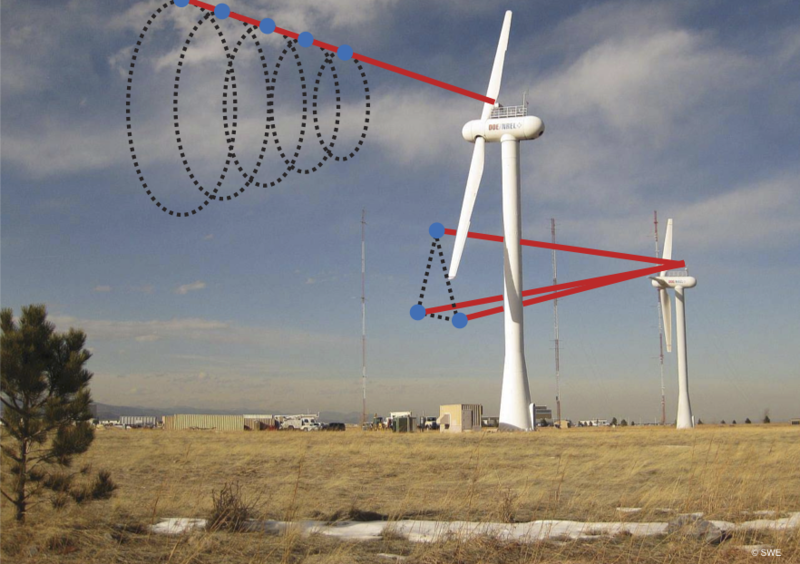 Since lidar and turbine manufacturers typically only know about their own part of the puzzle, current lidar systems are not optimized for wind turbine control applications. The potential mismatch between available lidar technology and the requirements for control purposes can be divided into two categories: lidar systems might not provide the necessary wind speed information for control; or lidar systems could be too complex, and thus costly, to be adopted for wind turbine control. Further, there are no guidelines in current standards for using lidar-assisted control in the certification of wind turbines. In particular it is not clear, how lidar systems can help to mitigate extreme loads, how the effect of lidar can be included in a realistic simulation of extreme events, and finally how this can be standardized in guidelines. In order to discuss the potential use of lidars for load verification of wind turbines, it is first necessary to understand the procedure of load verification thoroughly. The main objective of a load verification campaign is to obtain (IEC/DNV etc.) certification of the prototype turbine. Wind turbines are designed according to the IEC 61400-1/3 standards, where a range of wind conditions are prescribed. A load case matrix is created based on different wind conditions, and several load simulations on different wind turbine components are carried out. Eventually damage equivalent load and fatigue damage are calculated, which provides a basis for dimensioning of the different wind turbine components. Subsequently a prototype turbine is manufactured and is installed at a test site for verification of the actual loads experienced by the turbine as compared to the simulated loads. The load measurements are usually carried out using strain gauges mounted on different wind turbine components, whereas the wind conditions are obtained using meteorological mast anemometry. The instrumentation on the mast usually consists of cup anemometers and wind vanes installed on booms at three heights at some distance in front of the wind turbine. From the time series data of these instruments first- and second-order statistics are estimated; amongst others mean wind speed, wind direction, wind speed profile, and turbulence intensity. Correspondingly statistics of the loads from the measured load time series are estimated. Eventually, the wind and load statistics are plotted are against each other to check the correlation between them. Simultaneously new load simulations are carried out using the measured wind data (instead of the IEC standard wind conditions). The newly simulated loads are then plotted on top of the measured loads, and subsequently verified to check whether the measured loads are smaller than the simulated loads. It is usually observed that the simulated loads do not compare very well with the measured loads, both in terms of accuracy and precision. Two reasons have been attributed to such discrepancy; first is the lack of availability of measurements with high spatial resolution, and the second is the distance between the mast and the turbine. Lidars have the potential to counter both these problems. In particular its use could lead to reducing the amount of material used for constructing certain components, and thereby reducing the cost of a wind turbine. Nevertheless there are some barriers in the use of lidars for load verification. Lidars are proven to be quite accurate and precise for estimating the first-order statistics such as the mean wind speed, wind direction and the wind profile . However, estimating second-order statistics such as the turbulence intensity from lidar measurements is not yet acceptable. In , two barriers in using the ground-based lidar in a VAD scanning mode have been identified; first is the probe volume averaging, and the second is the contamination due to the cross-correlations of different components of the wind vector. The second barrier can be countered to a considerable extent by either using a different scanning configuration and data processing technique (e.g. six-beam, Sathe et al. (2015)), or by using three lidars intersecting at a point. The challenge of probe-volume filtering still remains to be tackled. Besides, due to the physical limitations of the lidars, spatially interspersed measurements cannot be obtained at very high sampling rates. This presents a further challenge in capturing all the relevant turbulence scales that influence the loads on the wind turbine. An alternative to using ground-based lidars is to use nacelle-based lidars. However besides tackling the aforementioned challenges, a robust algorithm is yet to be developed for combining measurements in a vertical plane for estimating second-order statistics. Different configurations suggested above present different economic challenges. Particularly using three lidar systems would increase the cost of measurements by a factor of three. It is therefore necessary to couple the benefits of using any configuration with the potential reduction in LCOE. A barrier to such coupling is that there is no robust model that provides a link between lidar-assisted load verification and LCOE. Explore the benefits of lidar-assisted control for the cost of wind energy: Work planned together with Task 37. Give recommendations on how to improve lidar systems for control application. Initiate guidelines on how to use lidar in the load verification and certification process of wind turbines. Harris, M. Hand, and A. Wright, “Lidar for turbine control,” NREL, Tech. Rep. January 2006. Schlipf, P. Fleming, F. Haizmann, A. Scholbrock, M. Hofsäß, A. Wright, and P. W. Cheng, “Field testing of feedforward collective pitch control on the CART2 using a nacelle-based lidar scanner,” Journal of Physics: Conference Series, vol. 555, no. 1, p. 012090, 2014. Scholbrock, P. Fleming, L. Fingersh, A. Wright, D. Schlipf, F. Haizmann, and F. Belen, “Field testing LIDAR based feed-forward controls on the NREL controls advanced research turbine,” in Proceedings of the 51st AIAA Aerospace Sciences Meeting Including the New Horizons Forum and Aerospace Exposition, Dallas, USA, 2013. Kumar, E. Bossanyi, A. Scholbrock, P. Fleming, M. Boquet, R. Krishnamurthy, “Field Testing of LIDAR Assisted Feedforward Control Algorithms for Improved Speed Control and Fatigue Load Reduction on a 600kW Wind Turbine”, EWEA Annual Event, Paris, France, November 2015. Schlipf, P. Fleming, S. Raach, A. Scholbrock, F. Haizmann, R. Krishnamurthy, M. Boquet, A. Wright, P. W. Cheng, “An Adaptive Data Processing Technique for Lidar-Assisted Control to Bridge the Gap between Lidar Systems and Wind Turbines”, EWEA, Paris, France, 2015. Arora and C. Carcangiu, “Advanced controls for cost of energy reduction of floating offshore wind turbines,” in Presentation at the EWEA Offshore, Copenhagen, Denmark, 2015. European Academy of Wind Energy. Long-term research strategy. www.eawe.eu. Sathe, R. Banta, L. Pauscher, K. Vogstad, D. Schlipf, S. Wylie, “Estimating Turbulence Statistics and Parameters from Ground- and Nacelle-Based Lidar Measurements”, IEA Wind Task 32 Expert Report, 2015. Sathe, J. Mann, N. Vasiljevic, L. Guillaume, “A six-beam method to measure turbulence statistics using ground-based wind lidars”, Atmospheric Measurement Techniques, Vol. 8, 2015, p. 729-740.